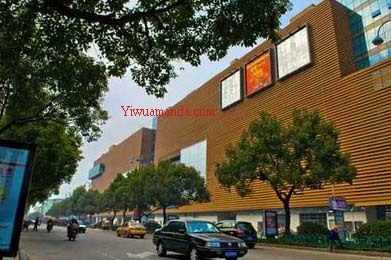 Yiwu huangyuan market was opened on 13 February, 1992; Huangyuan Market of China Commodity City has a building area of 160,000 m2. The hardware facilities and booths configuration in the market gain remarkable improvement and enhancement after three market layout adjustments in 2002, 2004 and 2005. Now, it has four main industries that cover daily-use general merchandise, cotton knitting, shoes and thread & ribbons. Yiwu Huangyuan Garments Market is located in the most bustling area in Yiwu city. Covering a total area of 117 mu and construction area of 420,000 square meters, the 8-floor building of Yiwu Huangyuan Garments Market holds 5,000 booths and underground parking lots. Huangyuan Market has a strong cohesion and outstanding advantage of commodity features. The commodities are sold all over the nation and exported to 191 countries and regions. The identification work of suppliers ’qualification to station in Huangyuan Market and the 5th district of Yiwu International Trade Mart is in full swing. In the meantime，92% of the reconstruction project of Huangyuan Market has been completed with more than 1，000 workers’ hard workday and night .Hundreds of famous domestic shopping malls and distribution companies come to Huangyuan Market to purchase billions Yuan worth of commodities every year. The exportation of commodities grows rapidly and an average of more than 3000 foreign trade companies and foreign agents come to sourcing in the market everyday. Huangyuan Market boasts standard management, superior service and convenient transportation that have Jiangbin Parking Lot and many bus routes around the market. It is an appointed shopping & tourism spot by Zhejiang Tourist Bureau and a “Three-star Market” titled by Provincial Industrial & Commercial Bureau, but now the date of new Huangyuan Market is coming soon. The decoration of new market has been almost completed. It is learnt that besides the business area, Yiwu new Huangyuan Market also is fit with a 4-star business hotel. The new Huangyuan Market has 8 floors, which seems a promising sale in the near future.